Harris School Solutions provides the industry’s best Training and Support. We’re proactive in helping you so you’ll never feel like you’re getting left behind. AptaFund is robust enough to handle mass updates and data entry in real time, and allows you to access and update information from any device, conveniently from the cloud. All of AptaFund’s modules are fully integrated and feature flexible grids, so you can move and format information and reports however you need to. AptaFund keeps your information accurate and organized by updating it in real time the second you enter data. 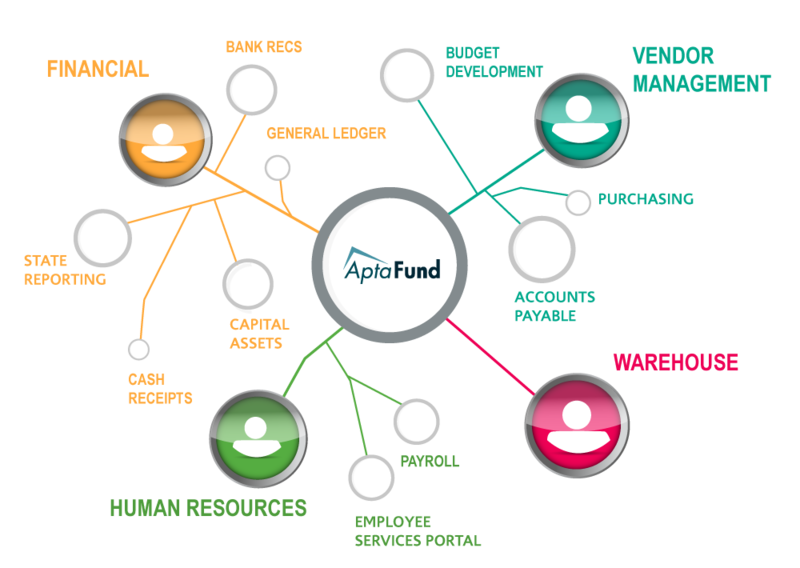 AptaFund is the configurable online fund accounting and business management software system that’s perfect for charter schools/networks and public schools/districts with anywhere from 1 to 15,000 students. Bringing HR data into one system with your Financial data. Having the power to handle large-scale data entry and mass-updates. Making smart decisions with data at your fingertips, integrated across every module. Improving accuracy with real-time data, instantly updated. Quickly exporting data from flexible grids. Intuitively navigating the friendly, straightforward interface. Conveniently accessing and updating information from the cloud. Saving time with an efficient Employee Self Service module. Reporting with less work using built-in state/county reports. Stop scrambling, shuffling, and searching for your data. AptaFund takes the information you need and puts it right at your fingertips, right when you need it. PLUS: No matter how you choose to transfer, export, or arrange your information, you can count on AptaFund to keep your sensitive Financial data secure, up-to-date, and accurate. Protects your information and records the details for every transaction with built-in safeguards. GAAP, GASB 34, and USFR compliant. Tiered user- and account-code security. Available as a self-hosted solution or as a “Software as a Service” (SaaS) solution that lets you rely on Harris to host, back up, maintain, update, and secure your data. Requires minimal local hardware and, therefore, low capital expenditure. Supports conversion from legacy systems with a data-import module, tools, and templates. Lets you configure the modules based on your district’s needs. Auditor friendly, with AptaTrace following each transaction from its source to the GL and back while offering secure, view-only access for auditors. Robust but customizable, with over 120 pre-defined reports and custom-report abilities offering unlimited options for viewing critical data and evaluating performance. Convenient, since it’s internet enabled and users need only a compatible browser at their workstation.